GST is the abbreviation for Geosciences in Space and Time. The framework of GST provides components for storage and administration as well as visualization and making CAD data available in a network based infrastructure. Thus it contains the means for implementing a spatial data infrastructure (SDI) for 3D-CAD-data and focuses on 3D and 4D underground models as well as simulation models. Fig. 1 GST is made up of several components which communicate via a network by using standards defined by the OGC and others. GST Storage has been completely rewritten in order to provide a fast interface to a large repository of 3d subsurface data. While focusing on open standards, like OGC’s Simple Feature Standard, GST is perfectly capable of reading industry standards like for example Gocad ASCII or ISATIS Grid format. The coupling of GST to a database management system like Oracle or Postgres allows to integrate the 3d subsurface models with customized data models providing additional information like editor’s metadata or your custom geologic information system. GST offers the possibility to store the known types of CAD systems like: points, lines, triangulated surfaces, tetrahedron networks and regular grids. Furthermore properties assigned to the geometries can be stored in such a way that it is possible to yield spatially distributed parameters. Typical examples are estimated rock parameters while geologic modeling: e.g. permeability in groundwater flow models or storage capacity in CO2 sequestration models. Additionally the GST system is equipped with GST WebClient, a Web 2.0 application. The WebGL based application which is capable of displaying the content of the GST Storage directly in a web browser without the need of a sophisticated CAD software. Thus it allows the communication of 3D models to a large number of customers. 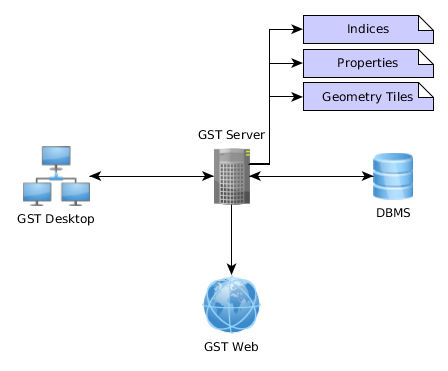 In addition to the basic geometries GST Storage and GST Desktop empowers the user to manage so called ’seamless models‘ by introducing a new geometry type. This enables the editing of spatially expanded models that nevertheless have a high spatial resolution, which can occur while modeling for example federal states. Many editors can work on the model simultaneously and they have the possibility to follow the single steps through versioning. Thus the users can follow the progress of their team, validate changes and reintroduce new versions of models to their partners. Working with GST on a large area is not bound to a fixed tiling. GST Storage will generate a tile for the requested area on the fly. Furthermore the database is capable of creating and administrating different levels of details of the models. In a network based system this helps reducing the data in the first place. While watching the first rough approximation the more detailed model is loaded subsequently.